The utility frequency, (power) line frequency (American English) or mains frequency (British English) is the nominal frequency of the oscillations of alternating current (AC) in an electric power grid transmitted from a power station to the end-user. In large parts of the world this is 50 Hz, although in the Americas and parts of Asia it is typically 60 Hz. Current usage by country or region is given in the list of mains power around the world. During the development of commercial electric power systems in the late 19th and early 20th centuries, many different frequencies (and voltages) had been used. Large investment in equipment at one frequency made standardization a slow process. However, as of the turn of the 21st century, places that now use the 50 Hz frequency tend to use 220–240 V, and those that now use 60 Hz tend to use 100–127 V. Both frequencies coexist today (Japan uses both) with no great technical reason to prefer one over the other and no apparent desire for complete worldwide standardization. Unless specified by the manufacturer to operate on both 50 and 60 Hz, appliances may not operate efficiently or even safely if used on anything other than the intended frequency. In practice, the exact frequency of the grid varies around the nominal frequency, reducing when the grid is heavily loaded, and speeding up when lightly loaded. However, most utilities will adjust the frequency of the grid over the course of the day to ensure a constant number of cycles occur. This is used by some clocks to accurately maintain their time. Several factors influence the choice of frequency in an AC system. Lighting, motors, transformers, generators and transmission lines all have characteristics which depend on the power frequency. All of these factors interact and make selection of a power frequency a matter of considerable importance. The best frequency is a compromise among contradictory requirements. In the late 19th century, designers would pick a relatively high frequency for systems featuring transformers and arc lights, so as to economize on transformer materials, but would pick a lower frequency for systems with long transmission lines or feeding primarily motor loads or rotary converters for producing direct current. When large central generating stations became practical, the choice of frequency was made based on the nature of the intended load. Eventually improvements in machine design allowed a single frequency to be used both for lighting and motor loads. A unified system improved the economics of electricity production, since system load was more uniform during the course of a day. The first applications of commercial electric power were incandescent lighting and commutator-type electric motors. Both devices operate well on DC, but DC could not be easily changed in voltage, and was generally only produced at the required utilization voltage. If an incandescent lamp is operated on a low-frequency current, the filament cools on each half-cycle of the alternating current, leading to perceptible change in brightness and flicker of the lamps; the effect is more pronounced with arc lamps, and the later mercury-vapor and fluorescent lamps. Open arc lamps made an audible buzz on alternating current, leading to experiments with high-frequency alternators to raise the sound above the range of human hearing. Commutator-type motors do not operate well on high-frequency AC, because the rapid changes of current are opposed by the inductance of the motor field. Though commutator-type universal motors are common in AC household appliances and power tools, they are small motors, less than 1 kW. The induction motor was found to work well on frequencies around 50 to 60 Hz, but with the materials available in the 1890s would not work well at a frequency of, say, 133 Hz. There is a fixed relationship between the number of magnetic poles in the induction motor field, the frequency of the alternating current, and the rotation speed; so, a given standard speed limits the choice of frequency (and the reverse). Once AC electric motors became common, it was important to standardize frequency for compatibility with the customer's equipment. where f is the frequency in Hertz and P is the number of poles. Direct-current power was not entirely displaced by alternating current and was useful in railway and electrochemical processes. Prior to the development of mercury arc valve rectifiers, rotary converters were used to produce DC power from AC. Like other commutator-type machines, these worked better with lower frequencies. With AC, transformers can be used to step down high transmission voltages to lower customer utilization voltage. The transformer is effectively a voltage conversion device with no moving parts and requiring little maintenance. The use of AC eliminated the need for spinning DC voltage conversion motor-generators that require regular maintenance and monitoring. Since, for a given power level, the dimensions of a transformer are roughly inversely proportional to frequency, a system with many transformers would be more economical at a higher frequency. Electric power transmission over long lines favors lower frequencies. The effects of the distributed capacitance and inductance of the line are less at low frequency. Generators can only be interconnected to operate in parallel if they are of the same frequency and wave-shape. By standardizing the frequency used, generators in a geographic area can be interconnected in a grid, providing reliability and cost savings. Many different power frequencies were used in the 19th century. Very early isolated AC generating schemes used arbitrary frequencies based on convenience for steam engine, water turbine and electrical generator design. Frequencies between 16⅔ Hz and 133⅓ Hz were used on different systems. For example, the city of Coventry, England, in 1895 had a unique 87 Hz single-phase distribution system that was in use until 1906. The proliferation of frequencies grew out of the rapid development of electrical machines in the period 1880 through 1900. In the early incandescent lighting period, single-phase AC was common and typical generators were 8-pole machines operated at 2,000 RPM, giving a frequency of 133 hertz. Though many theories exist, and quite a few entertaining urban legends, there is little certitude in the details of the history of 60 Hz vs. 50 Hz. The German company AEG (descended from a company founded by Edison in Germany) built the first German generating facility to run at 50 Hz. At the time, AEG had a virtual monopoly and their standard spread to the rest of Europe. After observing flicker of lamps operated by the 40 Hz power transmitted by the Lauffen-Frankfurt link in 1891, AEG raised their standard frequency to 50 Hz in 1891. Westinghouse Electric decided to standardize on a higher frequency to permit operation of both electric lighting and induction motors on the same generating system. Although 50 Hz was suitable for both, in 1890 Westinghouse considered that existing arc-lighting equipment operated slightly better on 60 Hz, and so that frequency was chosen. The operation of Tesla's induction motor, licensed by Westinghouse in 1888, required a lower frequency than the 133 Hz common for lighting systems at that time. [verification needed] In 1893 General Electric Corporation, which was affiliated with AEG in Germany, built a generating project at Mill Creek to bring electricity to Redlands, California using 50 Hz, but changed to 60 Hz a year later to maintain market share with the Westinghouse standard. The first generators at the Niagara Falls project, built by Westinghouse in 1895, were 25 Hz, because the turbine speed had already been set before alternating current power transmission had been definitively selected. Westinghouse would have selected a low frequency of 30 Hz to drive motor loads, but the turbines for the project had already been specified at 250 RPM. The machines could have been made to deliver 16⅔ Hz power suitable for heavy commutator-type motors, but the Westinghouse company objected that this would be undesirable for lighting and suggested 33⅓ Hz. Eventually a compromise of 25 Hz, with 12-pole 250 RPM generators, was chosen. Because the Niagara project was so influential on electric power systems design, 25 Hz prevailed as the North American standard for low-frequency AC. A General Electric study concluded that 40 Hz would have been a good compromise between lighting, motor, and transmission needs, given the materials and equipment available in the first quarter of the 20th century. Several 40 Hz systems were built. The Lauffen-Frankfurt demonstration used 40 Hz to transmit power 175 km in 1891. A large interconnected 40 Hz network existed in north-east England (the Newcastle-upon-Tyne Electric Supply Company, NESCO) until the advent of the National Grid (UK) in the late 1920s, and projects in Italy used 42 Hz. The oldest continuously operating commercial hydroelectric power station in the United States, Mechanicville Hydroelectric Plant, still produces electric power at 40 Hz and supplies power to the local 60 Hz transmission system through frequency changers. Industrial plants and mines in North America and Australia sometimes were built with 40 Hz electrical systems which were maintained until too uneconomic to continue. Although frequencies near 40 Hz found much commercial use, these were bypassed by standardized frequencies of 25, 50 and 60 Hz preferred by higher volume equipment manufacturers. The Ganz Company of Hungary had standardized on 5000 alternations per minute (41​2⁄3 Hz) for their products, so Ganz clients had 41​2⁄3 Hz systems that in some cases ran for many years. In the early days of electrification, so many frequencies were used that no one value prevailed (London in 1918 had ten different frequencies). As the 20th century continued, more power was produced at 60 Hz (North America) or 50 Hz (Europe and most of Asia). Standardization allowed international trade in electrical equipment. Much later, the use of standard frequencies allowed interconnection of power grids. It was not until after World War II with the advent of affordable electrical consumer goods that more uniform standards were enacted. In the United Kingdom, a standard frequency of 50 Hz was declared as early as 1904, but significant development continued at other frequencies. The implementation of the National Grid starting in 1926 compelled the standardization of frequencies among the many interconnected electrical service providers. The 50 Hz standard was completely established only after World War II. By about 1900, European manufacturers had mostly standardized on 50 Hz for new installations. The German Verband der Elektrotechnik (VDE), in the first standard for electrical machines and transformers in 1902, recommended 25 Hz and 50 Hz as standard frequencies. VDE did not see much application of 25 Hz, and dropped it from the 1914 edition of the standard. Remnant installations at other frequencies persisted until well after the Second World War. Because of the cost of conversion, some parts of the distribution system may continue to operate on original frequencies even after a new frequency is chosen. 25 Hz power was used in Ontario, Quebec, the northern United States, and for railway electrification. In the 1950s, many 25 Hz systems, from the generators right through to household appliances, were converted and standardized. Until 2009, some 25 Hz generators were still in existence at the Sir Adam Beck 1 (these were retrofitted to 60 Hz) and the Rankine generating stations (until its 2009 closure) near Niagara Falls to provide power for large industrial customers who did not want to replace existing equipment; and some 25 Hz motors and a 25 Hz power station exist in New Orleans for floodwater pumps. The 15 kV AC rail networks, used in Germany, Austria, Switzerland, Sweden and Norway, still operate at 16⅔ Hz or 16.7 Hz. In some cases, where most load was to be railway or motor loads, it was considered economic to generate power at 25 Hz and install rotary converters for 60 Hz distribution. Converters for production of DC from alternating current were available in larger sizes and were more efficient at 25 Hz compared with 60 Hz. Remnant fragments of older systems may be tied to the standard frequency system via a rotary converter or static inverter frequency changer. These allow energy to be interchanged between two power networks at different frequencies, but the systems are large, costly, and waste some energy in operation. Rotating-machine frequency changers used to convert between 25 Hz and 60 Hz systems were awkward to design; a 60 Hz machine with 24 poles would turn at the same speed as a 25 Hz machine with 10 poles, making the machines large, slow-speed and expensive. A ratio of 60/30 would have simplified these designs, but the installed base at 25 Hz was too large to be economically opposed. In the United States, Southern California Edison had standardized on 50 Hz. Much of Southern California operated on 50 Hz and did not completely change frequency of their generators and customer equipment to 60 Hz until around 1948. Some projects by the Au Sable Electric Company used 30 Hz at transmission voltages up to 110,000 volts in 1914. Initially in Brazil, electric machinery were imported from Europe and United States, implying the country had both 50 Hz and 60 Hz standards according to each region. In 1938, the federal government made a law, Decreto-Lei 852, intended to bring the whole country under 50 Hz within eight years. The law did not work, and in the early 1960s it was decided that Brazil would be unified under 60 Hz standard, because most developed and industrialized areas used 60 Hz; and a new law Lei 4.454 was declared in 1964. Brazil underwent a frequency conversion program to 60 Hz that was not completed until 1978. In Mexico, areas operating on 50 Hz grid were converted during the 1970s, uniting the country under 60 Hz. 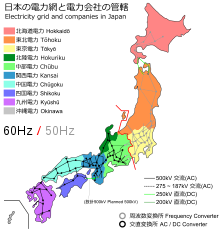 In Japan, the western part of the country (Nagoya and west) uses 60 Hz and the eastern part (Tokyo and east) uses 50 Hz. This originates in the first purchases of generators from AEG in 1895, installed for Tokyo, and General Electric in 1896, installed in Osaka. The boundary between the two regions contains four back-to-back HVDC substations which convert the frequency; these are Shin Shinano, Sakuma Dam, Minami-Fukumitsu, and the Higashi-Shimizu Frequency Converter. Even by the middle of the 20th century, utility frequencies were still not entirely standardized at the now-common 50 Hz or 60 Hz. In 1946, a reference manual for designers of radio equipment listed the following now obsolete frequencies as in use. Many of these regions also had 50 cycle, 60 cycle or direct current supplies. Where regions are marked (*), this is the only utility frequency shown for that region. Other power frequencies are still used. Germany, Austria, Switzerland, Sweden and Norway use traction power networks for railways, distributing single-phase AC at 16⅔ Hz or 16.7 Hz. A frequency of 25 Hz is used for the Austrian Mariazell Railway, as well as Amtrak and SEPTA's traction power systems in the United States. Other AC railway systems are energized at the local commercial power frequency, 50 Hz or 60 Hz. Traction power may be derived from commercial power supplies by frequency converters, or in some cases may be produced by dedicated traction powerstations. In the 19th Century, frequencies as low as 8 Hz were contemplated for operation of electric railways with commutator motors. Some outlets in trains carry the correct voltage, but using the original train network frequency like 16⅔ Hz or 16.7 Hz. Power frequencies as high as 400 Hz are used in aircraft, spacecraft, submarines, server rooms for computer power, military equipment, and hand-held machine tools. Such high frequencies cannot be economically transmitted long distances; the increased frequency greatly increases series impedance due to the inductance of transmission lines, making power transmission difficult. Consequently, 400 Hz power systems are usually confined to a building or vehicle. Transformers, for example, can be made smaller because the magnetic core can be much smaller for the same power level. Induction motors turn at a speed proportional to frequency, so a high frequency power supply allows more power to be obtained for the same motor volume and mass. Transformers and motors for 400 Hz are much smaller and lighter than at 50 or 60 Hz, which is an advantage in aircraft and ships. A United States military standard MIL-STD-704 exists for aircraft use of 400 Hz power. Regulation of power system frequency for timekeeping accuracy was not commonplace until after 1926 with Laurens Hammond's invention of the electric clock driven by a synchronous motor. During the 1920s, Hammond gave away hundreds of such clocks to power station owners in the U.S. and Canada as incentive to maintain a steady 60-cycle frequency, thus rendering his inexpensive clock uniquely practical in any business or home in North America. Developed in 1933, The Hammond Organ uses a synchronous AC clock motor to maintain correct speed of its internal 'tone wheel' generator, thus keeping all notes pitch perfect, based on power-line frequency stability. Today, AC-power network operators regulate the daily average frequency so that clocks stay within a few seconds of correct time. In practice the nominal frequency is raised or lowered by a specific percentage to maintain synchronization. Over the course of a day, the average frequency is maintained at the nominal value within a few hundred parts per million. In the synchronous grid of Continental Europe, the deviation between network phase time and UTC (based on International Atomic Time) is calculated at 08:00 each day in a control center in Switzerland. The target frequency is then adjusted by up to ±0.01 Hz (±0.02%) from 50 Hz as needed, to ensure a long-term frequency average of exactly 50 Hz × 60 s/min × 60 min/h × 24 h/d = 7006432000000000000♠4320000 cycles per day. In North America, whenever the error exceeds 10 seconds for the east, 3 seconds for Texas, or 2 seconds for the west, a correction of ±0.02 Hz (0.033%) is applied. Time error corrections start and end either on the hour or on the half-hour. Efforts to remove the TEC in North America are described at electric clock. Real-time frequency meters for power generation in the United Kingdom are available online – an official National Grid one, and an unofficial one maintained by Dynamic Demand. Real-time frequency data of the synchronous grid of Continental Europe is available on websites such as mainsfrequency.com and gridfrequency.eu. The Frequency Monitoring Network (FNET) at the University of Tennessee measures the frequency of the interconnections within the North American power grid, as well as in several other parts of the world. These measurements are displayed on the FNET website. In the United States, the Federal Energy Regulatory Commission made Time Error Correction mandatory in 2009. In 2011, The North American Electric Reliability Corporation (NERC) discussed a proposed experiment that would relax frequency regulation requirements for electrical grids which would reduce the long-term accuracy of clocks and other devices that use the 60 Hz grid frequency as a time base. The primary reason for accurate frequency control is to allow the flow of alternating current power from multiple generators through the network to be controlled. The trend in system frequency is a measure of mismatch between demand and generation, and is a necessary parameter for load control in interconnected systems. Frequency of the system will vary as load and generation change. Increasing the mechanical input power to any individual synchronous generator will not greatly affect the overall system frequency, but will produce more electric power from that unit. During a severe overload caused by tripping or failure of generators or transmission lines the power system frequency will decline, due to an imbalance of load versus generation. Loss of an interconnection while exporting power (relative to system total generation) will cause system frequency to increase upstream of the loss, but may cause a collapse downstream of the loss, as generation is now not keeping pace with consumption. Automatic generation control (AGC) is used to maintain scheduled frequency and interchange power flows. Control systems in power stations detect changes in the network-wide frequency and adjust mechanical power input to generators back to their target frequency. This counteracting usually takes a few tens of seconds due to the large rotating masses involved (although the large masses serve to limit the magnitude of short-term disturbances in the first place). Temporary frequency changes are an unavoidable consequence of changing demand. Exceptional or rapidly changing mains frequency is often a sign that an electricity distribution network is operating near its capacity limits, dramatic examples of which can sometimes be observed shortly before major outages. Large generating stations including solar farms can reduce their average output and use the headroom between operating load and maximum capacity to assist in providing grid regulation; response of solar inverters is faster than generators, because they have no rotating mass. As variable resources such as solar and wind replace traditional generation and the inertia they provided, algorithms have had to become more sophisticated. Energy storage, such as batteries, are fulfilling the regulation role to an expanding degree as well. Frequency protective relays on the power system network sense the decline of frequency and automatically initiate load shedding or tripping of interconnection lines, to preserve the operation of at least part of the network. Small frequency deviations (i.e.- 0.5 Hz on a 50 Hz or 60 Hz network) will result in automatic load shedding or other control actions to restore system frequency. Smaller power systems, not extensively interconnected with many generators and loads, will not maintain frequency with the same degree of accuracy. Where system frequency is not tightly regulated during heavy load periods, the system operators may allow system frequency to rise during periods of light load, to maintain a daily average frequency of acceptable accuracy. Portable generators, not connected to a utility system, need not tightly regulate their frequency, because typical loads are insensitive to small frequency deviations. Load-frequency control (LFC) is a type of integral control that restores the system frequency and power flows to adjacent areas back to their values before a change in load. The power transfer between different areas of a system is known as "net tie-line power". The general control algorithm for LFC was developed by Nathan Cohn in 1971. The algorithm involves defining the term "area control error" (ACE), which is the sum of the net tie-line power error and the product of the frequency error with a frequency bias constant. When the area control error is reduced to zero, the control algorithm has returned the frequency and tie-line power errors to zero. AC-powered appliances can give off a characteristic hum, often called "mains hum", at the multiples of the frequencies of AC power that they use (see Magnetostriction). It is usually produced by motor and transformer core laminations vibrating in time with the magnetic field. This hum can also appear in audio systems, where the power supply filter or signal shielding of an amplifier is not adequate. Most countries chose their television vertical synchronization rate to approximate the local mains supply frequency. This helped to prevent power line hum and magnetic interference from causing visible beat frequencies in the displayed picture of analogue receivers. Another use of this side effect has resulted in its use as a forensic tool. When a recording is made that captures audio near an AC appliance or socket, the hum is also inadvertently recorded. The peaks of the hum repeat every AC cycle (every 20 ms for 50 Hz AC, or every 16.67 ms for 60 Hz AC). Any edit of the audio that is not a multiplication of the time between the peaks will distort the regularity, introducing a phase shift. A continuous wavelet transform analysis will show discontinuities that may tell if the audio has been cut. Furfari, F.A., The Evolution of Power-Line Frequencies 133⅓ to 25 Hz, Industry Applications Magazine, IEEE, Sep/Oct 2000, Volume 6, Issue 5, Pages 12–14, ISSN 1077-2618. Rushmore, D.B., Frequency, AIEE Transactions, Volume 31, 1912, pages 955–983, and discussion on pages 974–978. Blalock, Thomas J., Electrification of a Major Steel Mill – Part II Development of the 25 Hz System, Industry Applications Magazine, IEEE, Sep/Oct 2005, Pages 9–12, ISSN 1077-2618. ^ Fractional Hz frequencies originated in the 19th century practice that gave frequencies in terms of alternations per minute, instead of alternations (cycles) per second. For example, a machine which produced 8,000 alternations per minute is operating at 133⅓ cycles per second. ^ a b Owen, Edward (1997-11-01). "The Origins of 60-Hz as a Power Frequency" (PDF). Industry Applications Magazine. IEEE. pp. 8, 10, 12–14. ^ Atitude Editorial. "Padrões brasileiros". ^ H.T. Kohlhaas, ed. (1946). Reference Data for Radio Engineers (PDF) (2nd ed.). New York: Federal Telephone and Radio Corporation. p. 26. ^ Fink, Donald G.; Beaty, H. Wayne (1978). Standard Handbook for Electrical Engineers (Eleventh ed.). New York: McGraw-Hill. pp. 16–15, 16–16. ISBN 978-0-07-020974-9. ^ Entsoe Load Frequency Control and Performance, chapter D.
^ "Manual Time Error Correction" (PDF). naesb.org. Retrieved 4 April 2018. ^ "National Grid: Real Time Frequency Data – Last 60 Minutes". ^ "Western Electricity Coordinating Council Regional Reliability Standard Regarding Automatic Time Error Correction" (PDF). Federal Energy Regulatory Commission. May 21, 2009. Retrieved June 23, 2016. ^ "Time error correction and reliability (draft)" (PDF). North American Electric Reliability Corporation. Retrieved June 23, 2016. ^ "Power-grid experiment could confuse clocks – Technology & science – Innovation – NBC News". msnbc.com. ^ "First Solar Proves That PV Plants Can Rival Frequency Response Services From Natural Gas Peakers". 19 January 2017. Retrieved 20 January 2017. ^ "USING RENEWABLES TO OPERATE A LOW-CARBON GRID" (PDF). caiso.com. Retrieved 4 April 2018. ^ Glover, Duncan J. et al. Power System Analysis and Design. 5th Edition. Cengage Learning. 2012. pp. 663–664. ^ "The hum that helps to fight crime". BBC News.